A grey pottery model of a standing pig with a plump body, naturalistically depicted facing forward in an alert position, the long ears folded down and with elongated eyes, prominent snout and pointed canines. The animal has a short tail, which is curled at its hindquarters. Its four strong legs and hooves are carefully detailed. The underneath of its body is hollowed out with four circular holes. The pottery is mostly covered with remains of burial earth, and only the back of the pig shows its greyish texture. The creation of pottery funerary pigs was first effected in the Hemudu culture (5500 – 3300 BC) during the Neolithic time, and a small pottery pig excavated from the Hemudu site in Yuyao, Zhejiang province in 1973 is a fine testimony. During the Han dynasty, a variety of tomb ceramics was produced as a substitute for human sacrifice. A group of pottery pigs was excavated from the Han Yang Ling (or known as the Yang Mausoleum of Han), the mausoleum of Emperor Jin (r.157-141 BC) of the Western Han dynasty located in Xianyang, Shaanxi province. 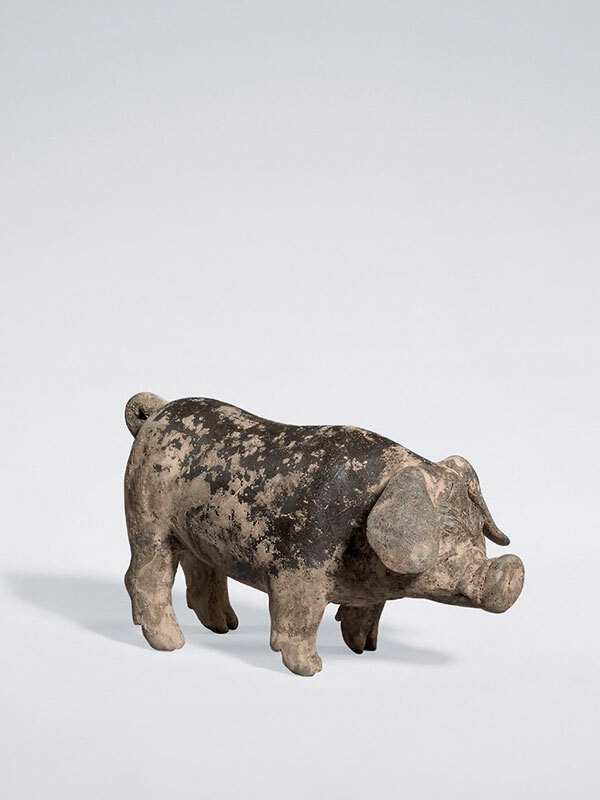 An example of an earthenware model of a pig dated to the Han dynasty is in the collection of the Royal Ontario Museum. A grey pottery model of a pigsty including a simply modelled pig, dated to the Western Han dynasty of the 1st century BC, is in the Meiyintang collection.